Serving the greater Platteville community since 1987. Welcome to Rosemeyer Jones Chiropractic Clinic! Official Chiropractors of UWP Athletics! 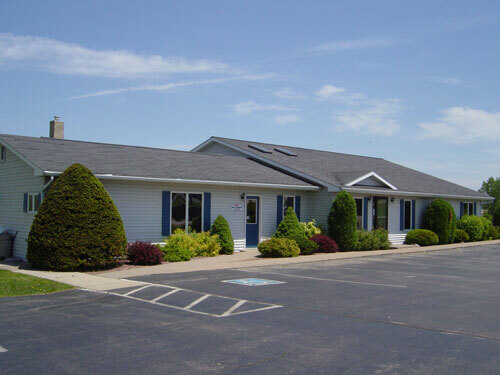 Located in the heart of Platteville, the leading health professionals at Rosemeyer Jones Chiropractic Clinic are dedicated to helping you achieve your health objectives -- combining skill and expertise that spans the entire chiropractic spectrum. Dr. Daniel Jones, Dr. Joe Rosemeyer and Dr. Dave Bergmann are committed to bringing you better health so you can get back to doing the things you love. Whether you are trying to become pain-free or seeking optimum wellness, the chiropractors at our clinic will support all of your health needs. Patients seeking treatment at Rosemeyer Jones Chiropractic Clinic with Dr. Jones, Dr. Joe, or Dr. Bergmann can be assured of receiving only the finest quality care through the use of modern chiropractic equipment and technology. Rosemeyer Jones Chiropractic offers many different treatment options to best fit your needs. Whether you prefer traditional, hands-on manipulation or mechanical adjusting, we have the techniques and tools to help. We also offer spinal decompression for patients with disc conditions. Dr. Dan, Dr. Joe, Dr. Dave and our staff have a genuine concern for your well-being. Our goal with every patient is to get them feeling their best and educate them on how to maintain a healthy spine and body. If you have any questions or would like to learn more about our clinic, please contact us; we are more than willing to help. We are ADJUSTING to meet your needs! In an effort to make ourselves much more accessible to the individuals that need chiropractic care, we have recently added on to a number of insurance companies as preferred providers. Those companies include The Alliance, Health Choices, WEA, United Health, WPS, Optum Health, Anthem Blue Cross Blue Shield, Gundersen Lutheran, DEAN, Unity and Quartz. Our clinic is up to date with new and current HIPAA compliance regulations. Policy information is available at our office. "After suffering 9 years with a herniated disc, I heard about Dr. Rosemeyer's clinic and the 3D ActiveTrac machine. I decided to try his method. I have received tremendous relief. After 4 months, I am able to do most of my housework and enjoy life again. I thank Dr. Rosemeyer and his wonderful staff."